If you love coffee and chocolate, you have to try this RXBAR! If you are not familiar with RXBARS, RXBARS are natural protein bars made with real food–including egg whites, dates and nuts. 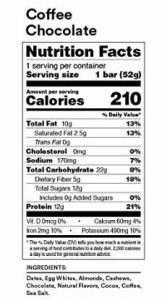 One RXBAR (depending on flavor) has 12 grams of protein, 7- 10 grams of fat, 13-15 grams of sugar and 5 grams of fiber. They are free of dairy, gluten, soy and added sugar. You can read more about RXBARS here. The Coffee Chocolate RXBAR has a strong espresso flavor. Add the right amount of chocolate and you get a delicious, nutritious snack. Pair it with a cup of coffee or a glass of milk and you will think you are being overly indulgent. For some reason, this flavor is seasonal. When you think of coffee, what seasons do you think of most? Fall, Winter, right? Well, not for the RXBAR folks. They think Spring and Summer is the only time for coffee! The Coffee Chocolate flavor is only available in the Spring and Summer. I even wrote to them last Winter, wondering why I could no longer find the Coffee Chocolate RXBARS. I was afraid they discontinued this flavor. I received a response saying that it is a seasonal flavor and not available at that time. I am happy to see it’s back now and I just ordered my second box of 12. I got one of my friends hooked on them too and when I told her they were available, she promptly ordered a box for herself. If you love coffee and chocolate and are looking for a natural bar with more than a few grams of protein, the Coffee Chocolate RXBAR may be the ultimate bar. Don’t miss out! Give these bars a try. these bars sound delicious. I’m always on the run and am constantly looking for protein enriched foods. I work out a lot and I’m also a vegetarian. these bars look like the perfect stow away for my day bag. The coffee chocolate RXBAR is definitely my first choice. great reviews!! Let me know what you think when you try the Coffee Chocolate RXBARS. I like coffee and I like chocolate, so this sound pretty good. I don’t really like the saturated fat and sugar but the rest sounds ok. I think should only be used as a supplement and not a meal replacement. What other flavors are available in this bar? 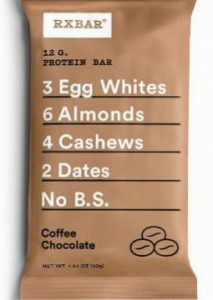 Hi I’m a big coffee drinker so this would be a great replacement for the Mocha which is chocolate and coffee but in this case on how you described it with the RXBARS this will be healthier. Hm. Now I’m curious and tempted to try this out on what you say in the article. I might give this a try someday? You really should try the Coffee Chocolate RXBARS! Don’t wait too long–remember they are seasonal! Let me know what you think when you try them. It sounds like a whole meal in one bar. That’s weird that it’s a seasonal item, especially for the spring and summer. I don’t think I would like this only because you said if you don’t like coffee you probably won’t like this. 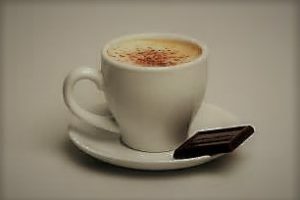 I drink coffee but not all the time, and only when there’s some sort of creamer or something to give the coffee some flavor. And, I’ve had protein bars before and they are anything but yummy. But, that doesn’t matter. What matters is you gave a brief but detailed description on what the bars are and what they consist of. I’m kind of confused as to why you have more cons than pros. Are you giving this a bad review or a good review? Regardless, very well thought out and brief and too the point. K.I.S.S. = Keep it Simple Sweetie. Thanks for your comment, Jake. Personally, I love many of the flavors of the RXBARS and the Coffee Chocolate is one of my favorites. You mentioned you don’t drink coffee a lot and add creamer for flavor. Well, this has chocolate with it, so it is not at all like plain coffee! But, there are many other flavors to try. Check out RXBARS REVIEWS. Don’t be afraid of the “women” part. My husband and my friend’s sons and their friends all love RXBARS! Also, although there are more cons than pros, I am trying to give an honest review. Some of the cons relate to things having nothing to do with the bar itself–like seasonality. It depends on what is important to you.